The World Responsible Tourism Awards to be presented at WTM London in November are now open for nominations and applications. They close on 6th August and are free to enter. The judges can only select from amongst those that enter so consider applying and if you know of organisations which you think worthy of an Award, then please encourage them to apply – you can do that here. In the prestigious Responsible Tourism Awards, we look for businesses, destinations, NGOs and others who are taking responsibility to make tourism better. We look for leaders who are taking responsibility to make tourism sustainable and to benefit local communities and their natural and cultural environments. Based on the ideas in the 2002 Cape Town Declaration on Responsible Tourism, our agenda is broader than just the environment although that is fundamental, our Awards also address the economic and socio-cultural agenda. We have looked at many different areas of responsibility ranging through disability access, animal welfare, cultural heritage, child protection, poverty reduction, water conservation, tour operating, river cruising, blogging and campaigning. We know that applying takes time, but leaders deserve to be recognised, winning a prestigious award helps you stand out from your competitors, and it helps you to review your efforts, celebrate your achievements with your staff and your customers. See what Glynn O’Leary, CEO of the African tour operator Transfrontier Parks Destinations has to say about what winning has meant to them. Since 2004 when the Responsible Tourism Awards were launched we have each year identified the Responsible Tourism leaders from amongst those who apply. We look for those who are making a positive contribution by reducing negative impacts or by increasing their local economic and social impacts, providing their staff with better terms and conditions of employment, or contributing to the conservation of wildlife and habitats, celebrating local culture or contributing to the conservation of heritage. We look for examples which inspire, educate, and challenge. We launched the Awards to recognise leaders and inspire others to follow. We explain why the judges made the decisions they did; transparency is a core value of Responsible Tourism, and we believe that it is our responsibility to explain why a particular leader has been awarded. Only by explaining why can we hope to inspire and educate others in what they might do to make tourism better. We publish the judges’ reasons on the web and in an annual report. The challenge comes from competition and establishing higher expectations amongst consumers. Since 2004 we have recognised Responsible Tourism leaders on four continents in cities and remote islands. The details of all the winners between 2004 and 2016 are available here. The process we use ensures that we can recognise leaders large and tiny, remote and well connected. We know that it takes effort to apply and we recognise that – we take all applications seriously as we go through the process of long listing, then shortlisting by two judges working together and finally the judging day when the judges review the merits of the applications and debate the merits before deciding that year’s winners. 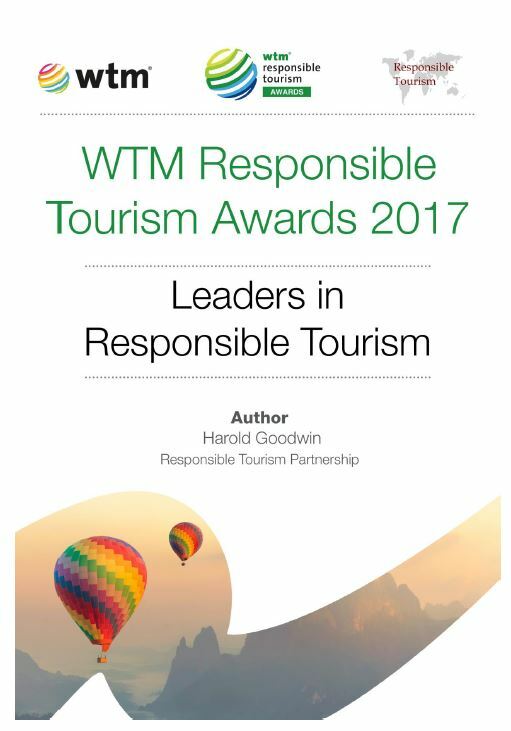 In 2017 WTM London took over the organisation of the Awards and are continuing with both World Awards and the regional sister awards in Africa and India. You can only win if you apply – what is stopping you?